Inspired by my own yoga and meditation practice, I created this pattern to reflect the feeling of serenity when I embrace the moment as it is. My intention is to inspire people to engage in their own practice. Influenced by 19th century French scenic wallpaper, I painted the design with gouache. Sold by the roll Roll size: 50” by 9’ long (comes in 54” wide untrimmed rolls) Pattern repeat: 50” by 29.5” long Pattern match: Straight Paper is printed to order. 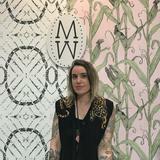 MERENDA WALLPAPER is a New York-based contemporary wallpaper design, manufacturing and installation studio inspired by near and far away lands, graffiti, tattoo art, abandoned buildings, underground history and the impermanence of all things. The design process ranges from photography to rubbings, illustration and painting, sparking viewers' imaginations of what came before, what will come after, what is beneath, and perhaps to catch a glimpse of how Nature always prevails. SARAH MERENDA fell in love with textiles at a young age, collecting vintage clothing from a local auction house on the eastern shore of Maryland and later working at a vintage clothing shop in Baltimore. She grew up in old farm houses, surrounded by wallpaper. Relocating to Atlanta, GA in 1996, she followed her six uncles into the trade of hanging wallpaper. Moving to New York City in 1999, Sarah continued her education at the Fashion Institute of Technology where she received her BFA in Textile Surface Design and spent a semester abroad at the Chelsea College of Art in Design in London. The Queens design studio was opened in 2015. MERENDA WALLPAPER’S mission is to create wallpapers that are contemporary and beautiful, sometimes quirky, inspired by nature, sensuality and the urban environment. With 20 years of experience installing wallpaper, their substrates are chosen for their ease of installation and eco friendly quality.